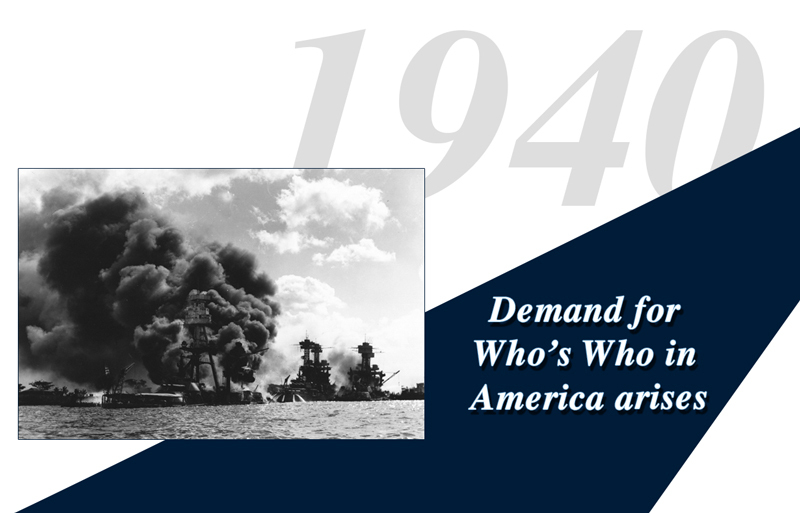 After the bombing of Pearl Harbor, a great demand for Who’s Who in America arises from the mushrooming war agencies in the first half of the 1940s. Only a fraction of the government orders could be met for Volume 22 (1942-1943), Volume 23 (1944-1945) and Volume 24 (1946-1947). One colonel calls publisher Wheeler Sammons and asks for 2,000 copies of Volume 23 for overseas use. With employee shortages the company does not even have 25 copies at their disposal. Sammons also recounts a story from 1944 where he receives an emphatic demand for an inordinate number of books from a large new installation. Once again he is not able to meet the demand and it isn’t until a year later, after the bombings of Hiroshima and Nagasaki that he recalls the call came from Oak Ridge, Tennessee, a production site for the Atomic Bomb.